The table market is filled with many different options with different features and price ranges. 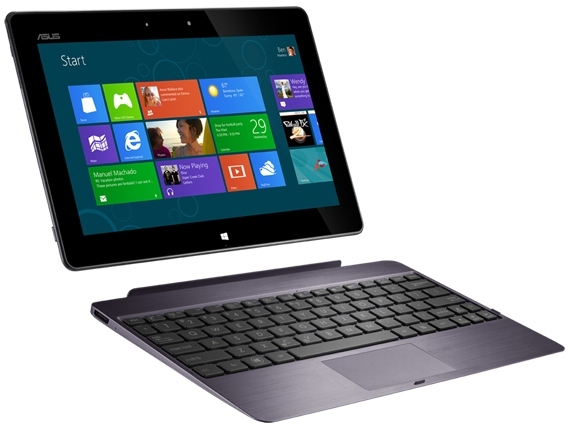 Now that Windows 8 is available there have been many new tablets with Windows 8 or Windows RT. The VivoTab RT is a new tablet from the maker ASUS which has made many popular Android tablets over the years including the Nexus 7 tablet from Google. 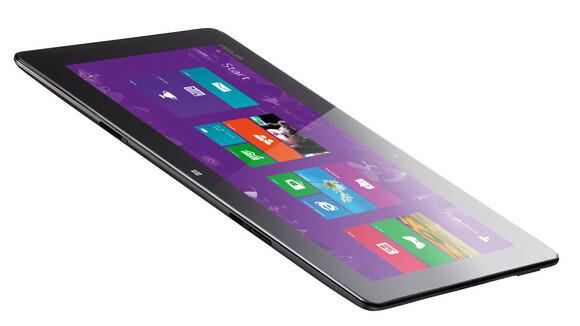 The VivoTab combines both tablet and laptop features all wrapped up in Windows RT. The VivoTab RT is surprisingly light for a 10 inch tablet and it fits well in my hands and is not uncomfortable to hold. For people with small hands the large 10 inch tablet may be hard to hold but for someone with large hands the tablet fits perfectly and feels lighter than the iPad. The tablet has decent speakers except that they are exactly where I put my hands to hold the tablet so that results in a little muffled sound when I am holding the tablet and using the speakers. This isn’t a big issue for me because I will either use ear buds when listening to music or videos, or if I want to use the speakers I will put the tablet in the keyboard dock and the speakers work well. But if you do not want the dock and plan on using the speakers this maybe an issue for you. The first thing you notice when using the VivoTab RT is the amazing display, even though it is not “Retina” like the iPad I think the 10 inch IPS screen has as good or even better looking display. The screen is bright even in the daylight so you won’t have any problems seeing the apps being displayed. The IPS screens makes viewing the tablet from many different angles and videos from Netflix or YouTube look really clean and sharp in HD. The Tegra 3 quad core processor makes games run well and look good when you are playing the game. The tablet can get sluggish when there are a lot of apps left open in the background which can happen with Windows RT even if you think you have closed an app it may not be closed. This is not a problem with the tablets hardware it is an issue with Windows RT software and one that will hopefully be fixed in an upcoming update. The tablet includes NFC support which is a feature I have not seem in other tablets and could become useful but right now is just and extra feature I don’t use. I purchased the 32GB model and with about 30 apps installed as well as some files I only have about 10GB of space left which is disappointing but a well-known issue with Windows RT tablets. The VivoTab does have a mini SD card slot which allows you to extend the storage space of the tablet. The front and back cameras on the VivoTab RT are pretty good and allow up to 1080p video but the camera does not work well in low light which is to be expected. The ASUS camera app has allows you to use filters and change photo settings which offer a nice level of detail compared to most other camera apps. 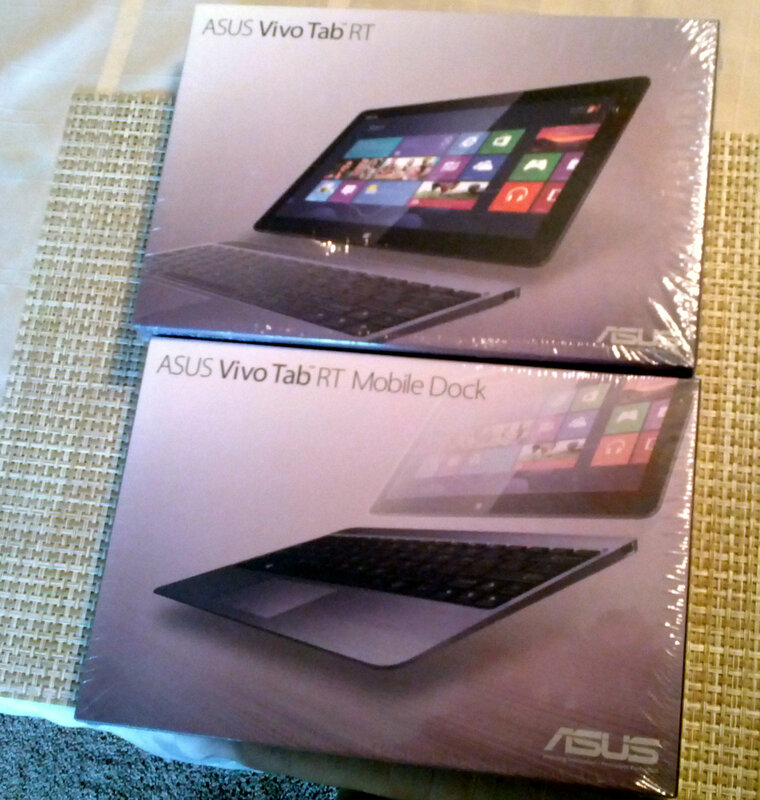 The biggest downside to the Asus VivoTab is not the fault of the tablet but Windows 8 itself. Many times when I have tried to do something or use a service I find that there is not an app created for the service on Windows Store. Because the Windows store is so new that causes a large gap when compare to the Play Store of App store and this can cause you to have to find workarounds to use web apps and services. This is one thing that will hopefully get better as time goes by but it can cause some frustration when you first start using Windows RT. 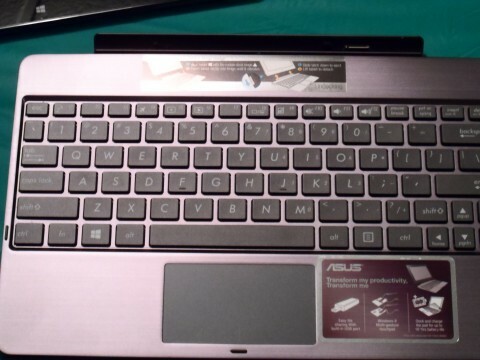 The keyboard dock connects to the VivoTab RT in an odd way, instead of using Bluetooth the keyboard dock has a tray on the back with the connector and a latch and you push the tablet in the tray matching the logo on the tablet until it vibrates which signifies that dock is connected. The tray rotates so you can change the position of the screen in relation to the keyboard or close it all the way and it becomes a netbook. The dock includes a touchpad which supports multi gestures and this works ok with Windows 8 but I rarely use it. One thing about the keyboard it is small in fact too small for me, if I type at my normal speed I sometimes hit the keys around the key I wanted to hit. This becomes very annoying and takes away from the whole point of a keyboard dock. I don’t think this will be an issue for most people who have smaller hands, but for someone like me it becomes infuriating and I have to type very slowly. It may be something you want to try out before buying especially if the main reason you’re purchasing a tablet is for business you need a keyboard that works for you. The dock comes with a usb port which can come in handy if you want to use a mouse or connect an external drive. The dock uses the same charging cable as the tablet which means one less cable to keep track of. ASUS claims when fully charged the dock will extend the battery life of the tablet to 16 hours which is almost double and even though I haven’t ran the tablet that long the dock does add significant battery life. So after using the ASUS VivoTab RT I believe that it is a very good tablet with dock and even though it has a few downsides, it would be a good choice for someone wanting a tablet that is within the Windows environment. Windows RT has many different places where improvements are needed to give the tablet the same functionality as other mobile OS, I hope that those are coming as well as more and more apps designed for Windows tablets. I would recommend this tablet for anyone who would like to try Windows 8 and has the need or want for Office 13 on the tablet. The ASUS VivoTab is the best Windows RT tablet for the price and even though I have not seen enough to make me move entirely to Windows RT this tablet may be a good choice for anyone out there that wants a more business focused tablet with the capability to be used as a laptop. Let me know if anyone has a Windows RT tablet that they think is better or if you use an ASUS VivoTab RT what has your experience been like? Wow, nice ASUS VivoTab RT review Thanks keep it up.